Iraq and the United State have agreed to tentative timetables for the withdrawal of U.S. troops from the battle-scarred country, Secretary of State Condoleeza Rice and Iraqi Foreign Minister Hoshyar Zebari said today. 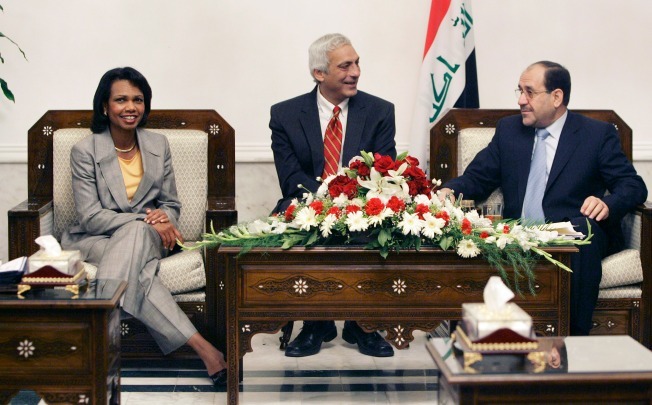 Appearing together at a news conference, Rice and Zebari mutually asserted that a final agreement between Washington and Baghdad on a withdrawal plan and accompanying strategic framework pact is close to fruition — but not there yet. "We have agreed that some goals, some aspirational timetables for how that might unfold, are well worth having in such an agreement," Rice told reporters after meeting with Iraqi officials, including Prime Minister Nouri al-Maliki. The two sides had come together on a draft agreement earlier this week and Rice made an announced visit to Baghdad to press officials there to complete the accord. Asked about fears expressed by neighboring countries over such a pact, Zebari, said in Arabic: "this decision (agreement) is a sovereign one and Iran and other neighboring countries have the right to ask for clarifications. ... There are clear articles (that) say that Iraq will not be used as a launching pad for any aggressive acts against neighboring countries and we already did clarify this." "This agreement determines the principle provisions, requirements, to regulate the temporary presence and the time horizon, the mission of the U.S. forces," Zebari said. On the plane en route here, Rice had told reporters: "The negotiators have taken this very, very far. But there is no reason to believe that there is an agreement yet. There are still issues concerning exactly how our forces operate." Her comments dampened speculation that agreement might be reached while she is in Baghdad on a several-hour visit, her first to Iraq since March, after U.S. and Iraqi officials said Wednesday that a draft document was done and awaiting approval from political leaders. Rice displayed similar caution in the news conference with Zebari. "Obviously, the American forces are here, coalition forces are here at the invitation of the Iraqi government," she said. "What we're trying to do is put together an agreement that protects our people, respects Iraq's sovereignty." " ... But the goal is to have Iraqi forces responsible for the security of Iraq," Rice added. "That is the goal and that has been the goal from the beginning. " She said the military surge has worked and "we are making progress together in the defeat of Iraq's enemies of all stripes." "We're not sitting here talking about an agreement to try to get out of a bad situation," Rice asserted, calling the agreement one that "builds on the success we have had in the last year. This agreement is based on success." Zebari conceded that officials had hoped to conclude the pact earlier, but he said that "it has taken us more time," citing internal political factors. "Really, we are very, very close to closing this agreement," he said, "and as we said from the begininng, there is no hidden agenda here." The foreign minister said the pact officials are trying to finish will be presented to Iraq's Executive Council for review. "Time is of the essense," he said, "but, really, we are redoubling our efforts to bring this to a successful conclusion."